Bumpers are often scuffed in car parks, gateposts and walls. The damage can range from minor scuffing, deeper scratches or even cracks and splits. 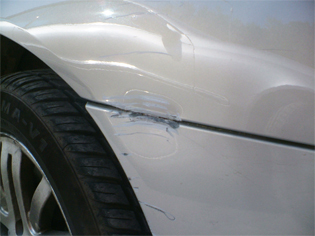 Bumper scuffs are also sometimes referred to as bumper scrapes or bumper scratches. Normally when this happens it scratches the paint revealing the black plastic underneath or possibly cause a dent if the impact was a little harder. This type of damage normally just affects the corner of your bumper or the bump strip. Car bumpers are actually made of plastic so rust is not an issue, although a scuffed bumper can effect the overall look of your car and have a negative affect the resale value. Rather than wasting money on an expensive complete bumper replacement, you can now restore your bumper to pristine condition by bringing your vehicle to DJ Auto Body Repairs. Whether your car bumper is painted or textured, you can be assured that DJ Auto Body Repairs specialists will be able to completely repair and remove any minor cosmetic damage caused by bumper scuffs, cracks, scratches and dents. We can repair almost all damage to bumpers, be it on a car, van or bus. Why should you use us to repair and restore your vehicle bumper? DJ Auto Body Repairs are a Manchester based garage. We can provide a wide range of services including minor to extensive bodywork damage i.e. scratches, scuffs, chips & paint defects. All our staff are fully trained and have all the necessary professional tools to deal with your car scratch repairs and dent repairs to the highest car bodyshop standards.